As globalization increasingly provides access to resources necessary for the spread of militant radicalism, it also allows valuable opportunities to begin healing animosities between certain Western countries and the developing world. The slogan of the environmental movement, think globally and act locally, would be an appropriate point of departure for building a global peace movement, says the author. (From Islamabad) THE IDEA OF WORLD PEACE IS NOT NEW. Utopian and liberal thinkers have been pondering such issues for a long time, but it is only today that we have the means to achieve them. The globalization phenomenon, rapid changes in the international communications technology, and the drastic expansion of the Internet have provided us a window of opportunity as never before. “The Muslim world is in a crisis of unimaginable proportions” We can, and even do, network for global causes. The primary example is the global environmentalist movement of our present times which happens to be remarkable in its own right. The global peace movement has not yet caught up to its potential. Given the necessary scope of global citizen action, how can we achieve peace? This brings us to the perplexing question of what is fundamentally required to achieve it. There are many reasons for the turmoil in our age, with feelings of alienation being the foremost passion fueling this violence. 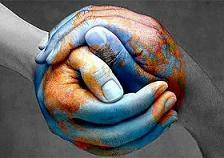 A fundamental shift in the world at large would be needed to achieve world peace. We must change ourselves in drastic ways for that to happen. We must all recognize that the greatest sentiment fueling the extremist phenomenon is alienation with modernity, crass materialism, “We cannot have world peace without justice for the deprived, the hapless, and the poorest of the poor and the wronged” and especially feelings of being trodden upon by stronger forces. Yes, a sense of injustice which includes social injustice is also fueling resentment against Western culture and civilization, especially in the Muslim world and other parts of the developing world. The Muslim world is in a crisis of unimaginable proportions. Corruption, injustice, misrule, and lack of visionary leadership are wreaking havoc on these societies, and things are not that much better in other Asian, African, and Latin American societies. Capitalism and western hegemony have their downsides, so to speak. “The globalization phenomenon is making it easier for radicalism to spread all over the world. Muslims, especially the romanticizing youth, are enraged as never before” We cannot have world peace without justice for the deprived, the hapless, and the poorest of the poor and the wronged. Here we are talking of politics and not just various shades of economic deprivation. In the Islamic world, present injustices are breeding resentment, alienation, frustration, and radicalism. In some societies, like Pakistan, Afghanistan, Iraq, Egypt, Somalia, and Bangladesh, all of the above are now present. However, the glaring issue for Muslims is political. Their political perceptions are what primarily fuel radicalism in a way that history has never witnessed before. Globalization is making it easier for radicalism to spread all over the world. Muslims, especially the romanticizing youth, are enraged as never before. “It is a common perception that poverty breeds radicalism. It does not. Injustice does” They resent Western cowardice, duplicity, wrongful deployment of military force, and the patronage of callous and corrupt governments ruling over them. These troubles are conveniently exported as Muslims get politicized on the issues of Muslim helplessness, the lack of institutional mechanisms to voice their protests, and the culpability of their own leadership to Western powers. Muslim political issues have galvanized a strong minority to action and violent protest. For example, injustices meted to Muslims in Palestine, Kashmir, southern Thailand, China, Iraq and the former USSR are the primary causes of Islamic radicalism. It is a common perception that poverty breeds radicalism. It does not. Injustice does. Therefore, justice is the key to peace. “Without tolerance there can be no peace. Peace must first start inside each of us in order for us to create peace in the world” Perceptions shape reality in complex ways. For example, the West (read United States and NATO) have been spreading vast amounts of money, military force, and police action in the Muslim world to stop militancy, yet it is growing at an alarming rate. The Global War on Terror has an undue emphasis on the use of force to the detriment of other available nonviolent options. There is not much of a push for solving intractable problems likely to cause anti-Western resentment in Muslim masses. There is an intellectual failure here. The Western powers are missing the forest through trees. This myopic vision cannot work. The simple fact is that without tolerance there can be no peace. Peace must first start inside each of us in order for us to create peace in the world. We see a total lack of tolerance towards other belief patterns, ideas, and ways of life. It must be considered fundamental that without mutual tolerance there can be no peace. We also have to network globally to achieve world peace one region at a time, meaning that one must primarily focus on his own region. Action most easily begins here, obviously. For example, in the greater Middle East, peace is indeed problematic. The question is why. We have been convinced that peace in the Middle East is beyond the governments in power in both the West and the Middle East itself. “A worldwide education is needed to instill new values based on toleration of others, compassion for others, and foremost we must all begin to believe in humanity” A very strong public pressure is needed to nudge the world’s political leadership to quick action. Unfortunately, the global peace movement is now largely dormant. Therefore, an attempt has to be made to do something about it. The people must take it upon themselves to move in a networked fashion, in which thousands of local peace groups are meshed into a global alliance. As a loose network of shared ideas, it does not need a structure. Information is enough. The key is public involvement. Ordinary citizens must resolve to take the matter into their own hands. First, they have to realize the gravity of the situation. Enough is enough. We need to knock some sense into the minds of the world’s leaders and especially the leadership of the Western world. The public must galvanize and rise to force the elected leadership to change course from needless military action to launch a strong global peace agenda. How and where do we begin? The key is education. There is simply no alternative. The mindset of realpolitik needs to be changed. Certainly, this is no easy task. But where there is a will there is a way. Ordinary citizens need to rise up and grasp the opportunities that are available today. The cry for action beckons to all of us. “Things are bad in the Muslim world. In other parts of Africa and Latin America, and even Asia, things are not that good either” A worldwide education is needed to instill new values based on toleration of others, compassion for others, and first and foremost we must all begin to believe in humanity. The bane of the dominant modern Western civilization is a new level of selfishness, callousness, indifference, and seclusion never seen before. Tragically, this is producing self-denial and thinking with our heads in the sand. Western civilization cannot be stable, peaceful, and prosperous when its neighbors are living in hell. That cannot and will not happen. It is time we all realized the gravity of the situation. Although things are bad in many other parts of the world, it is the Muslim world that needs immediate attention, as it is breeding the worst type of radicalism seen anytime in history. There is no sense in denying that things are bad in the Muslim world. In other parts of Africa, Latin America, and even Asia, things are not that good either. “Love is the prerequisite of peace. The essence of the global movement has to be love for humanity” We must begin to realize that immediate action is needed. The slogan of the environmental movement, think globally and act locally, is very apt for this situation. Muslim resentment has roots in sentiments of injustice. Let us begin to give justice where it is due. Strong public pressure on state administrations can yet save the day. The key is to network to achieve global peace. Given the infrastructure of today, we can do it. Everyone must try to make a contribution in bringing peace in their own region. Another prerequisite of achieving peace is to change the individual and make him or her more conducive to the peace message. We must shed our complacency for progress, our materialism for simplicity. We must share with others, have compassion for the weak, and primarily, we must have love for all. Love in capitals is the prerequisite of peace. The essence of the global movement has to be love for humanity. We must instill new values in our youth that calls for massive retooling of our educational institutions, especially higher education. It must be considered fundamental that a new beginning can be made. Surely we all wish the world was a better place, but maybe one good heart at a time can change all the evil in the present world. It is time for all the people to act on their beliefs. There is no other choice. I have few disagreements with the author regarding his identification of reasons/factors behind extremist phenomenon. The current radical extremism in the Muslim countries is a spontaneous phenomenon, thriving in the conducing environment of rising globalism, after its initiation by authoritarian regimes, on the behest of USA, in the context of first Afghan War—a final encounter with Communist USSR. Similarly strategies suggested by him do not seem practical. Members of International Civil Society and World Peace Movement can not succeed through symbolic public pressure in Western capitols until unless they translate their support in ballot-boxes for (peaceful) foreign policy agendas, to be adopted by their respective countries, rather than priority given to domestic policies.